This book is a clean funny read for people of all ages. It is the first book of the William Bradshaw series. Children enjoy the humor and adventure, whereas adults can appreciate the more subtle themes that color the series. 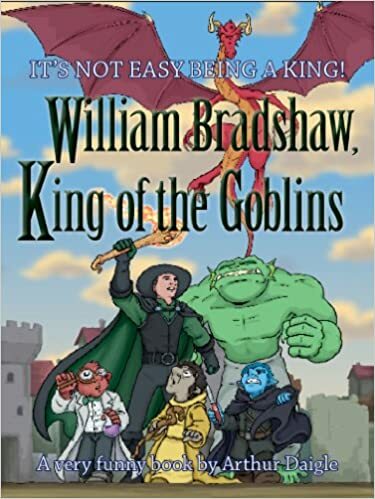 What do you think of William Bradshaw, King of the Goblins? It certainly is a most HUMOROUS Fantasy book for the Whole Family. Please leave a comment below. I would love to know what you think. Also click on one of the icons below to share this page. This entry was posted in Uncategorized and tagged Arthur Daigle, fantasy book, HUMOROUS Fantasy book, HUMOROUS Fantasy book for the Whole Family, King of the Goblins, King of the Goblins by Arthur Daigle, William Bradshaw, William Bradshaw King of the Goblins, William Bradshaw King of the Goblins by Arthur Daigle. Bookmark the permalink.